Clydesdale Western 1st XI crucially thrashed Glasgow University 1s at Glasgow Green to go top of Women’s National Division One on goal difference. ‘Dale Western knew a colossal margin would take themselves above Edinburgh University going into the indoor season following their 1-0 win over the champions the previous day. And the girls duly delivered an emphatic goal scoring performance – doubling a 5-0 lead at half time to finish with double figures and no concessions. The goals were spread around the team as there were doubles for Millie Brown, Lexi Sabatelli and Heather Howie. Jen Eadie, Frances Lonergan, Laura Mann And Anna Logan also scored a goal each to help Clydesdale Western overtake Edinburgh Uni in WNL 1. Goal difference is level but the girls ten goal win sees them with four more goals scored after eleven games, meaning they now hold top spot going into the indoor season. The L2s and L3s suffered contrasting 3-2 score lines in Women’s Championship Division One. 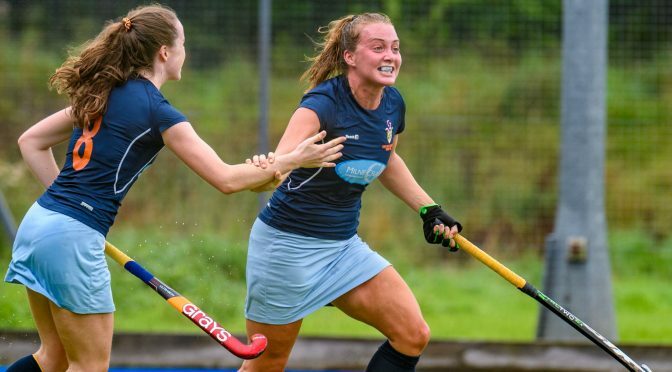 The L2s brought themselves back in to the league title picture as they won away to Grove Menzieshill 2s – goals coming from Heather Lang, Annabel Ballantyne and Hannah MacDonald. Goals from L3s players Helen Walker and Alice Sherwood were not enough as their side lost away to Watsonians 2s and severely dented their outside chances of mounting a league challenge. In the Women’s West District Cup and Plate competitions, the L4s and Loch Lomond 1s agreed to play their Round Two fixture in the Cup at a later date, whilst the L5s entered Round Two of the Plate following a 2-0 win away to Uddingston 3s – a goal each came from Lauren Halley and Rosalind Murray.